This South American is a relatively new species to cultivation but a very pretty one. It doesn’t set seed in most places, probably lacking the right pollinator. The tube is too narrow for bees to get in. It was brought into Australia for me by a nursery friend with quarantine facilities. The foliage is attractive because it is dark green and glossy. 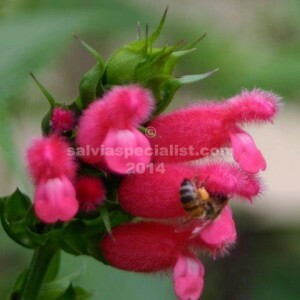 The flower buds are very pretty, a strong pink set in dark green calyces. It doesn’t seem real fussy what time of the year it flowers, probably dependent on the maturity of the ‘wood’. Right from early days there have been mixed reports of its behaviour. In tropical areas it could be called bad by some people as it could sucker. Mine didn’t sucker for a number of years and it is the original introduction. It doesn’t like frost and will burn under minus 2. The cold probably keeps mine in check.